Easy Keto Bacon Cheddar Ranch Dip Recipe – a creamy rich dip that is bursting with bacon, cheddar, and ranch flavor – and it’s naturally keto diet compliant and low carb! 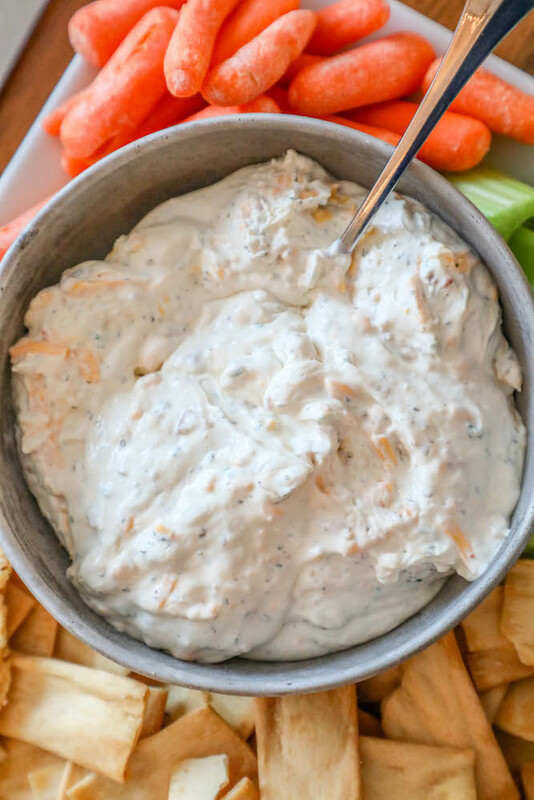 This easy bacon cheddar ranch dip is perfect for a crowd – rich, hearty, creamy, and super indulgent – and bursting with cheesy bacon ranch flavor! I mean…. who doesn’t love bacon and ranch? 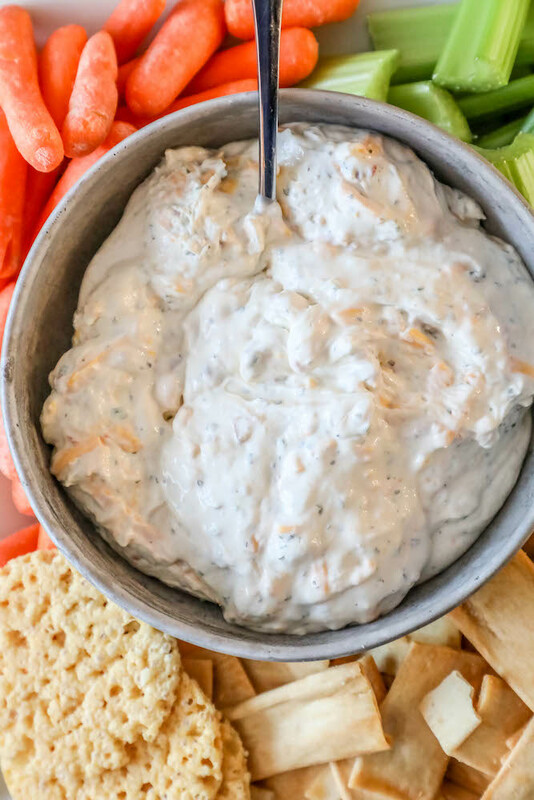 This is the perfect easy dip to serve for your big game parties… and it’s guaranteed to be one of the first things gobbled up! This dip is perfect with chips, pitas, vegetables – anything you’d love to cover in creamy goodness. Just Take Me To The Easy Keto Bacon Cheddar Ranch Dip Recipe Already! 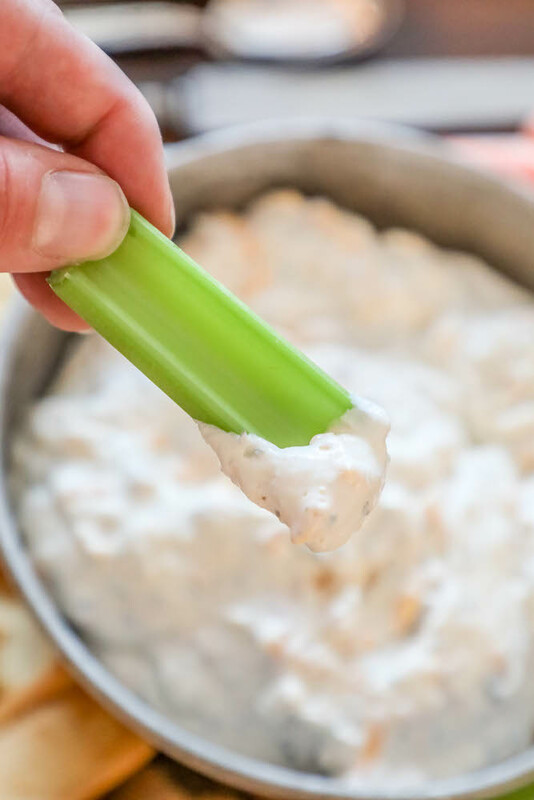 If you’d like to skip over my easy tips and tricks and get straight to this keto bacon cheddar ranch dip – please scroll to the bottom of the page, just above the comments. 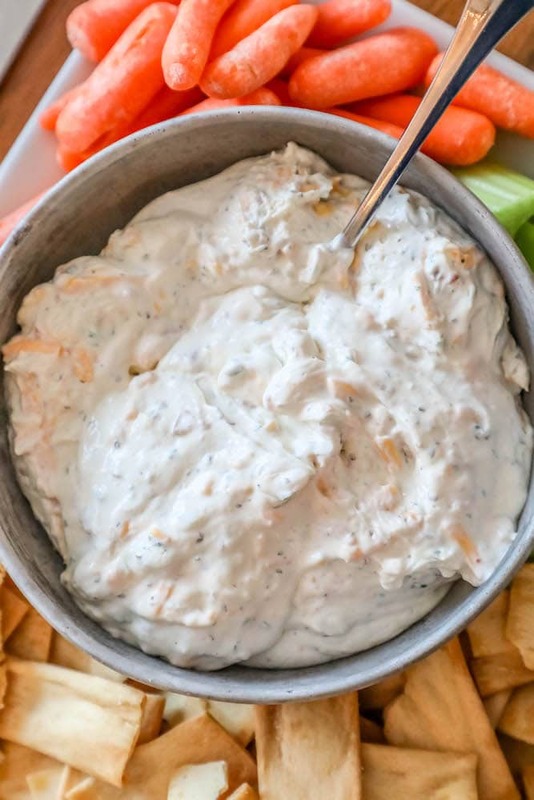 This easy cheesy bacon ranch dip is one of my favorite things to serve for parties, because it actually tastes better the next day, or after a few hours to come together in the refrigerator. This is the perfect dip to make the night before tailgating or throwing a big party – simply mix the day before, cover tightly with plastic wrap (or a glass leftovers container with a tight, air and smell proof lid), and remove when ready to serve! 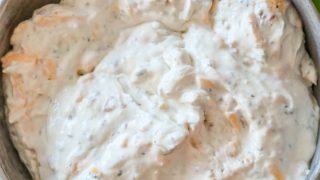 To make this cheesy ranch dip before a party, make it at maximum 24 hours before, and store in the refrigerator. Since this dip is based off sour cream, care needs to be taken to keep it at a safe serving temperature. When throwing a big party, I try to serve dips in a small bowl nestled into a bigger bowl with ice in it to keep the dip cold. I’ll check on it throughout the day, making sure I mix it up so the dip stays an even, properly chilled temperature. Don’t leave this dip out on the counter long enough to become warm – it should be kept cool to the touch and covered when not eating. Leftover dip should be immediately re-wrapped in plastic wrap and sent to the refrigerator to cool. Store leftovers for up to four days in the refrigerator, or two months in the freezer. For single-serve portions of dip, I like to use large ice cube containers (the fancy large sphere or square kind) to portion out dip, and then I’ll individually wrap each one in plastic wrap and keep in the freezer. To thaw, simply pull one portion from the freezer and let thaw naturally in the refrigerator overnight. Eat immediately. If you love this easy keto bacon cheddar ranch dip recipe as much as I do, please give it a five star review and help me share on facebook and pinterest! To shop my favorite keto cooking essentials, please visit my Amazon storefront here. Freshly cut vegetables, keto chips, or other chips for dipping. Cover bowl tightly and refrigerate - 1 hour to preferably overnight. Serve with vegetables, chips, keto chips, whatever you'd like to dip!